These were actually completed just prior to Christmas as I was keen to ensure I had made a start before we went a travelling around the relatives. 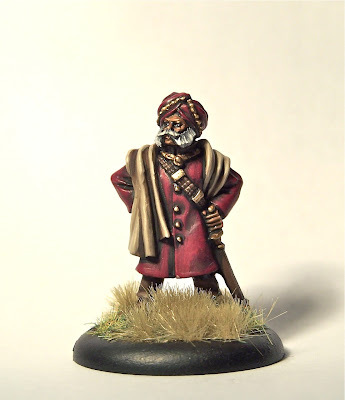 Firstly I have an important looking Indian Gentleman, possibly linked to an ancient Kali Cult or perhaps just an armed merchant. Who knows but you can be sure he'll turn up in an adventure or two. 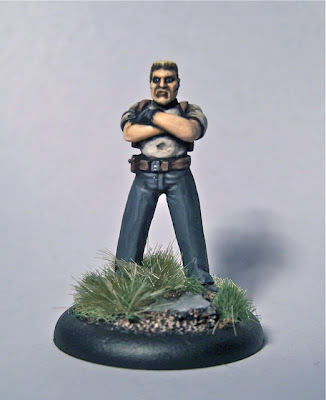 Second up is a great towering thug of a man, painted up perhaps as the perfect example of Aryan strength for my pulp Germans, either way he's mean and ready to be a real challenge should our heroes encounter him. I've some more Pulp pretty much finished but the Challenge rules state Curt gets first sight of the pictures so you lot will all have to wait till I've sent them to him and they've been published. Nice work, I like the tache on the Indian chap!